Canada has bestowed honorary Canadian citizenship on five foreigners of exceptional merit, and will welcome a sixth on Oct. 22, when Malala Yousafzai visits Canada. Canada occasionally bestows an honorary Canadian citizenship on foreigners of exceptional merit. It is a symbolic honour and does not give the recipients any rights, privileges or duties typically held by Canadian citizens. Wallenberg was a Swedish businessman and diplomat in 1944 when the War Refugee Board assigned him to save Hungarian Jews persecuted by the Nazis. He saved some 100,000 Hungarian Jews in Budapest. He was arrested by the Soviet government on Jan. 17, 1945 and died in captivity on July 17, 1947, at the age of 47. In 1985, Canada bestowed a posthumous honorary citizenship on Wallenberg, the first person to receive the honour. January 17 has been declared Raoul Wallenberg Day in Canada. Mandela became the first living person to receive honorary Canadian citizenship when Canada bestowed the honour on him in 2001, when he was 83. Parliament passed the motion on June 7, 2001, in recognition of Mandela's "great moral leadership to South Africa and to all humanity." The anti-apartheid champion spent 27 years in prison in South Africa before winning the country's first democratic election. The former South African president won a Nobel Prize in 1993. The Dalai Lama was presented with honorary Canadian citizenship when he was in Vancouver in September 2006. The award to the exiled Tibetan Buddhist leader and Nobel laureate drew criticism from China, which rules Tibet. Canada responded by saying it recognizes China as the government of China and Tibet, but has great respect for the Dalai Lama. The Dalai Lama was in Vancouver to open the Dalai Lama Centre for Peace and Education, the first such institution to bear his name. Burma's pro-democracy advocate has been an honorary Canadian citizen since 2007. She is also a Nobel laureate. Suu Kyi was under house arrest for 15 years by the military junta that rules Burma, also known as Myanmar. She would have become prime minister after her party won the 1990 election, but the military refused to hand over power. After Canadian Parliament passed the motion for the award in 2007, Prime Minister Stephen Harper called SuuKyi "a symbol of the desire of the Burmese people for political freedom." 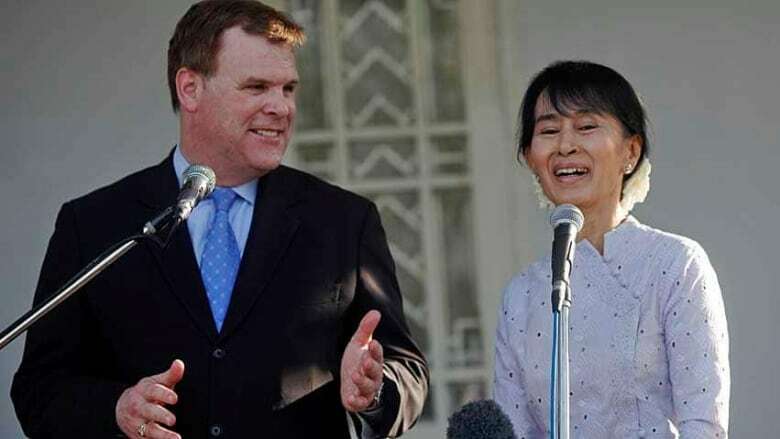 Foreign Affairs Minister John Baird presented the citizenship certificate to SuuKyi on March 8, 2012, during a historic visit to the Burma house where she was under house arrest. The Aga Khan, leader of 15 million Ismail Muslims worldwide, became an honorary Canadian citizen in 2009. He has been the imam of the Shia Ismaili Muslims since 1957, when he succeeded his grandfather. The Aga Khan is involved in humanitarian and development projects in Asia and Africa. A billionaire and a descendant of the Prophet Mohammed, the Aga Khan lives in France. The honour follows the work of the Aga Khan Development Network with Canadian Forces in Afghanistan.